The Wepod shuttle looks a lot like its EZ10 predecessor. The self-driving revolution is coming, and there's nothing you can do to stop it. 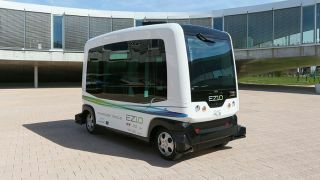 The Wepod robot-controlled shuttle is launching in the Netherlands in November and is reportedly the first autonomous car to take to public roads without human assistance. Self-driving buggies have been used before (at airports for example), but they usually operate along dedicated tracks and don't get close to cars that are being operated by drivers made from flesh and blood. More advanced self-driving cars (like those from Google) are regularly tested on public roads but always have a human driver present. The two towns of Wageningen and Ede will get the privilege of the Wepod's services and local residents can make bookings via an app - the app lets them specify where they want picking up, dropping off and even which seat they'd like to sit in. Researchers at Wageningen University are behind the new scheme and the vehicle will be remotely monitored at all times from a control room. While the Wepod is being tested it won't be risked during bad weather or rush hour. What's more, it's capped at a speed of 25 kilometres-per-hour (that's 15.5mph) so the vehicle won't be careering about on the roads at any great speed. Earlier versions of the shuttle have been extensively tested on a couple of University campuses. The Wepod is going to use a combination of GPS sensors and on-board cameras to work out where it is in the world, and the researchers behind its deployment hope to expand the scope of the scheme once they're confident the electric shuttle knows what it's doing. You can read more about the project here.